Windows 7 improved a lost compared to Windows Vista in terms of the performance, User Interface, scalability and Security. Many of the operating system security that included Kernel Patch protection, Data Execution Prevention, Enhanced UAC, Fingerprint scanner support, BitLocker. There are so many security features available in Windows 7, some of those are already in Vista and some of them are enhanced and some of them are new in Windows 7. User Access Control (UAC) is invented in Windows Vista and it is improved a lot in Windows 7. UAC will not allow any program or software to install without administrator permission. It is one of the useful features to prevent Malware. Even logged in to the system as a administrator requires privileges to install applications. In Windows 7 UAC is modified to allow actions automatically for the programs which will not cause any damage to the operating system. UAC can be customized in Windows 7. 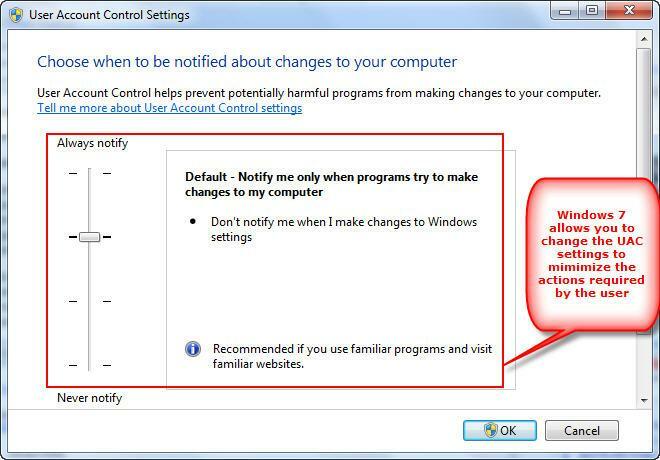 Windows 7 UAC has 4 options for the notifications which is useful to modify the settings. 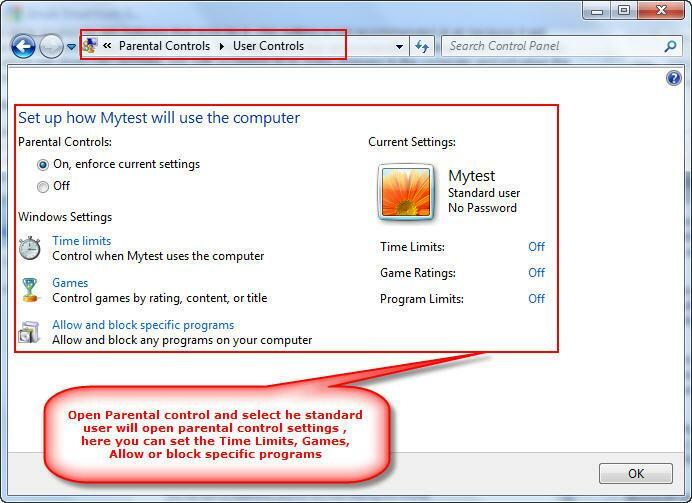 Parent Control in Windows 7 allows you to control the standard user access to the computer on specific time, Restricts to run the installed program, Restricts the User to play games. Windows Vista too has Parental Control but which is used to restrict the internet use and log the internet activities. Windows 7 removed the internet monitoring features and included user's access restriction in Parental Control. Parental control is used to control Standard system users to login access to certain time, so that the Standard user can login to the system at the specific time set by administrator. You can set a different time for each day. Parent control restricts the standard user to install or modify or open any software, only allowed software can be opened by the user. Parental control allows to run specific games based on the rating set by the Admin user. Rating is based on the age level of the game. BitLocker is used to encrypt the drives which protect the system from stealing the data through network. Windows Vista is having the option to encrypt the data in the fixed drives; it will not allow to encrypt the data in external drives like USB flash drives. Windows 7 is able to encrypt the external drives. BitLocker is not included in Windows 7 Home edition . When you open the BitLocker applet in Control Panel it will show all the Fixed drives and as well as Removable drives. While encrypting the drive you can set password and you can create a password recovery key so that if you forget the password also you can recover it by using the recovery key. Automatically unlock the drive facility is available only for the fixed drives. It will be useful in the network environment where the files are stored in a USB drive and the files can be encrypted to protect the data from the users to copy the sensitive data. Bit locker tool is very useful to encrypt and decrypt the Flash drive and memory card data. DirectAccess is a new feature which is included in Windows 7 and Windows Server 2008. This is very useful for the Network users who want to access the office network from remote computer without using VPN with secure access. You can set the group policy settings of a computer from the remote machine which is connected to the internet. It allows the users to connect to the office network from the home network using internet without the need of VPN. In order to use the DirectAccess feature in Windows 7 you need to have a DirectAccess server which should run in Windows Server 2008 R2 and in client machine should be Windows 7. It requires 2 network cards. DirectAccess works with NAP and NAC. Biometric security is one of the most secured methods to authenticate the access to the machine by using Eye retina, Finger print, Face identification and DNA. Windows 7 includes finger print reader software to identify the finger print to identify and allow login to the system. If your machine is having Finger print sensor then Windows 7 comes with a Finger print reader drivers. You can attach an external finger printer reader in Windows 7 machine and you can log in to the machine using finger printer reader. 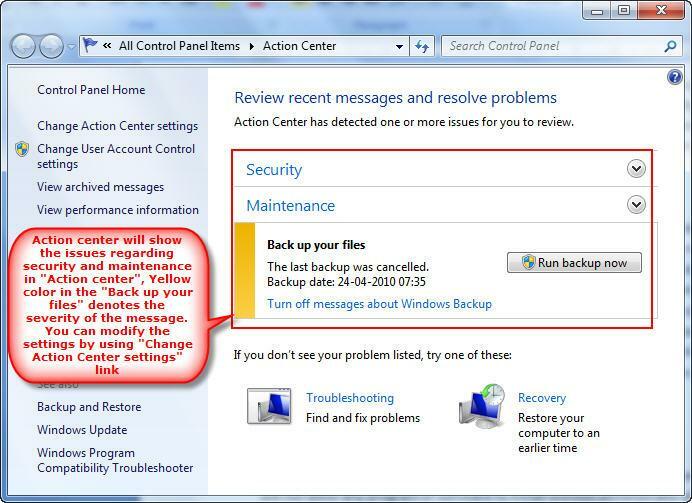 AppLocker is used to control the execution of unwanted and unknown software applications within the office network which can be applied in the group policy settings will be applied to all the desktop machines connected in the network will be an easy job for administrator to control the unauthorized software installation. It can also be set in an individual machine using Local Security policy. It is similar to Software Restriction Policies which is already in Windows XP and Windows Vista. Windows Filtering platform is introduced in Windows Vista. It is a set of Application programming interface (API). This set of API allows the developers to use the features to modify the settings of firewall, antivirus program and network applications which monitor the network traffic. It will be useful for the network based applications. Its API allows filtering and modifying the TCP/IP data packets which are transferred over the network and can replace the modified data back to original in the destination will add additional security when you transfer the data over network. Using WPF API you can access the different layers of the network and it will be used to create new antivirus software or monitoring the network software and related applications or C/C++ developers. Windows PowerShell is a command line scripting language which will help the system administrator to create a script and execute the script to control the system applications. You can automate the script to reduce the administrator work. Using PowerShell script you can access the Windows registry, Remote Desktop Services, Windows Management Instrumentation classes, Group policy and many more. Windows PowerShell version 2 is included in Windows 7. Windows PowerShell includes New cmdlets which is used to perform a function which is one line code to manage the settings of the system. Grouping all the cmdlets will make a PowerShell script. PowerShell Remote management will help to reduce the settings to be applied to all the computers in the network can be done using shell command from one machine. Transactions feature in PowerShell 2 will help to execute set of command and if one fails all the commands which are executed previously can be revoked and nothing will get affected. Developers and IT professionals use the PowerShell to manage the system with the automat the admin task using script. Internet Explorer is bundled with Windows 7 provides more security to the web browser. SmartScreen filter in IE 8 will protect against the unsafe web sites. Once you browse a site using IE 8 it will verify the site for potentials threats using SmartScreen filter feature. Cross site Scripting will identify the malicious code which is embedded in the web sites. Domain highlighting will highlight the real address of the Web site in the address bar and if the address is identified as unsafe then the address bar will be highlighted with red color. Data Execution prevention (DEP) will identify memory related vulnerabilities. If any code that try to execute from memory that are not executables then DEP will stop the execution will crash the page. A very nice informative article with pictures and explanations. For every operating system security is the key factor and it is very much necessary that we need security. This resource is very good in providing information about the security features in windows 7. Thank you so much for both of your comments. I will do better and post more good resources in the future.